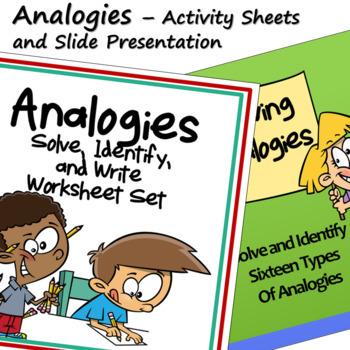 This resource includes both an Analogy Worksheet Set and the Analogies PowerPoint to introduce analogies and provide examples and practice with sixteen specific types of these word relationships. The Slide Presentation includes explanations and examples of each type along with student practice. At the end of the presentation, there are two student notebook pages which can be printed out in advance for students to complete as they view the slides. A completed version of the notebook pages is also included. 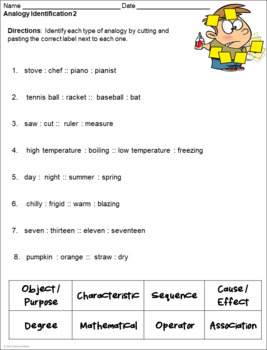 The Worksheet Set provides students with practice solving, identifying, and writing analogies. The sixteen types of these word relationships that are introduced in my two analogy PowerPoint presentations are also included in these practice activities. The first four sheets review analogies four types at a time, and the two following sheets each include eight types for more in-depth practice. 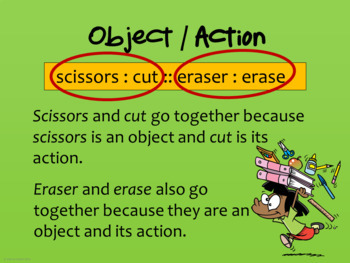 Additional activity sheets include cut and paste, multiple choice, and illustrating analogies. For an additional analogy resource that is versatile and works well with small groups and classroom games, see these Analogy Task Cards. You can also see additional vocabulary resources here.